Listed among the earliest American settlers in the Davisville area are William Montgomery and his four sons. A grandson of William Montgomery built this house in the 1880s. William Montgomery (1802-1877) and his sons are the earliest American settlers in the South Putah district. After a brief but successful venture in mining, theMontgomerys found suitable land for agricultural operations in Yolo County. They are believed to have settled early in 1851 in a triangular area (thereafter known as the“Montgomery Sink” where the original Putah Creek disappeared into the tule swamplands to the east. Alexander (1822-1884), one of four sons of William, farmed a section of land where thepresent Willowbank and Oakside subdivisions are located. Alexander marriedSusan Martin Montgomery, originally from Fairfax County. Alexander and Susan Montgomery had fourteen children, three died in infancy. Three of their children married children of Charles Glockler: Lee Jackson Stewart married Katherine; Andrew married Katherine; and Orlena married Ed. Lee and Katherine had three children: Lee, Delbert and Mabel. This one story vernacular house has a single gable form with the ridge placed parallel to the street. Although apparently vernacular in origin, the house has a collection of elegant details, primarily in its cave and fascia moldings. There is a veranda which covers the entire street facade. The form and details are derived and abstracted from Greek Revival Style. What has happened since the Montgomery family lived here? 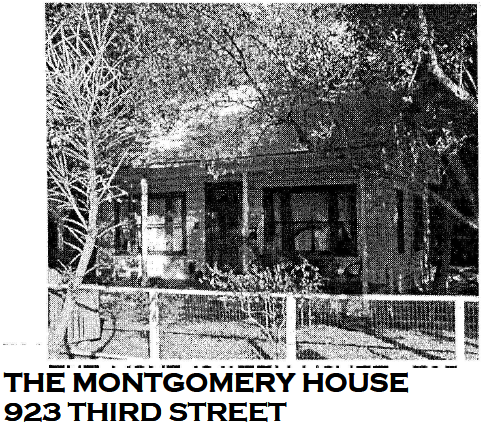 Marguerite Montgomery, a schoolteacher in Davis, sold the house after the death of her mother. recently, his daughter has renewed her interest in the property. Ms. Hopkins has a sweet spot for this historic home and has rented the property to some folks who also care about preserving it. A young couple purchased the home circa 2000 and made renovations. They sold the property to their contractor, in 2003 who has completed the renovation and recently moved next to it a small vintage home that was threatened with demolition.